Corporate lawyers, Cushman & Wakefield found an original way to celebrate the closing of a deal with IKEA. 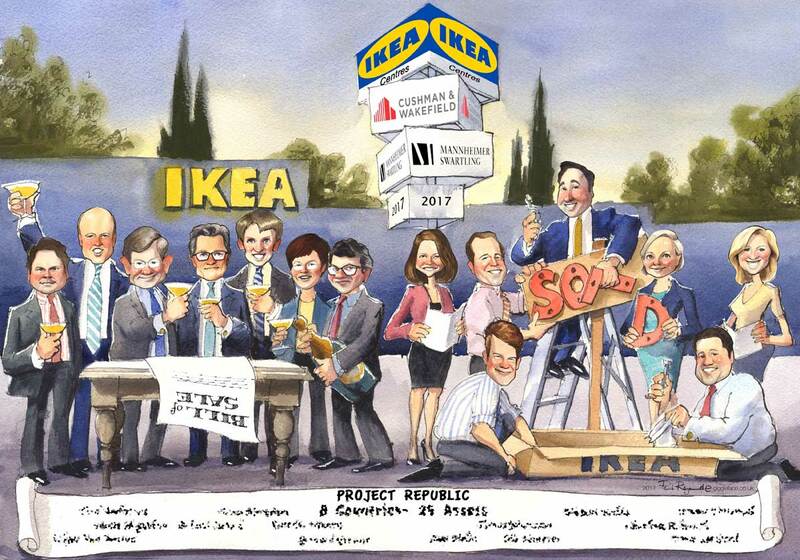 They commissioned a printed and framed group caricature as a gift for each person involved in the deal – to be presented at the closing dinner. My name is Paul Raymonde from GiggleFace, and I specialise in creating corporate caricature gifts from your brief and your photos. These group caricatures are tailored to your need, whether for a deal tombstone, retirement or leaving gift, a birthday present or a team appreciation award. If you don’t have a concept I will suggest scenarios that work well graphically and the characters depicted can be part of the action. I make preliminary sketches so that you can approve the layout, design and likenesses before the final painting. This is the time to iron out all the snags as the final artwork is difficult to change. The likenesses that I create will look like the photo that you supply. Therefore it is best to supply clear head-shots which show the subject smiling and preferably not looking dour or pulling strange faces. These expressions become exaggerated in caricature and could possibly make the subject look unpleasant. The characters and background are painted in pen and watercolour, giving it a traditional feel but the final artwork is an assemblage in Photoshop. This makes it possible to add text, titles and logos and make small tweaks before printing.